It’s Sunday and for this Sunday that means too things: planning out my week and school tomorrow!! Eeek!! Last day of summer vacation! Monday – I’ll most likely go back to making Mondays one mile days due to time. I’m hoping to leave school in time to make it to BodyPump in the afternoon. Thursday – Today will be tricky. I have my open house, Hayden’s Open House and coaching. I’m not sure how I’ll juggle all that but it’ll sort itself out. Going for at least a mile to keep my streak up! Sunday – 11 miles. Hitting double digits now for both days on the weekend. We picked some yummy dishes this week!! Thursday will probably be take out since we have a full schedule. I may grab salads from Panera on my way home. Try to keep it healthy and fresh. Monday – 3 miles early and Body Pump class I missed BP all last week, so I need to get a class in this week! Thursday – Early 4 miles and then additional miles with my training group. They are up to 5 minutes running and doing awesome! We already ate our favorite recipe of this week’s choices, Shrimp and Chorizo Paella. We have a few more meals left from last week’s Hello Fresh delivery and this week’s meals will be here on Friday. I get to say my two favorite words during marathon training this week. What are they?! BACK DOWN! After a few weeks of gaining miles, this week is a back down week and I am so happy. I feel really great with all my training so far, not really tired, no aches and pains, but I’m just ready to run a little bit less this week. And on top of that, we’re headed to Williamsburg for one last summer hurrah! Monday – 3-4 miles With a meeting at school and other appointments, I’m not sure if I’ll run early or later in the day. I’m thinking later will fit in better. For Friday through Sunday, I’m giving myself the one mile a day, at least. I can see that I’d run early all of those days before we head out. I’m leaving it up in the air, but I’ll get at least a mile in to keep my streak going. We had another awesome week of choices from Hello Fresh. We cooked one of our three meals this week already so we have a few more yummy dishes to cook! What’s on your fitness plan? Has your fall training started? Any yummy meals planned? I’m starting week 4 of 7 Bridges Marathon training. So far, I’ve been rolling through each week feeling really good. Despite the heat and humidity, my runs are going as scheduled and I’ve had some really solid runs. This is my last week of building mileage, a back down week is coming up soon. I also plan on adding in two different short weight/HIIT workouts throughout the week too. We are still loving Hello Fresh and our weekly options. Each week, I am so excited to see what choices we have for the upcoming week. Eating home cooked meals is a huge change for us and I’m seeing the benefits in how I feel and in my weight. It is far easier to maintain and lose when I’m eating meals that I’m cooking. We still treat ourselves to a night out or two for dinner, but it’s not an every day thing. I’m starting week 3 of 7 Bridges Marathon training. I’ve surprised myself as I’ve kicked up the miles. I’m handling them well even with all the heat and humidity and I’m actually seeing some improvement. Ready for another training week! Monday – Body Pump and 4-5 miles. Leaving it open to see how I feel after BP. Those weekend miles are slowly creeping up. We have some good choices coming to us this week from Hello Fresh! I’m really excited anout the variety of meals we have going on this week. What’s on your fitness and meal plan this week? Anything exciting? Week two of marathon training is kicking off! I’ll be keeping the same momentum this week and tackle all of my runs and workouts this week. I’m juggling my runs around this week based on upon commitments and some fun things we have planned this weekend. Hello Fresh is not disappointing again this week! It is the start of marathon training!!! 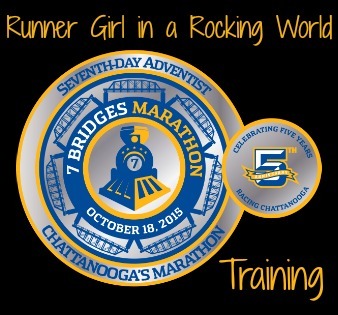 Yes, this week kicks off training for 7 Bridges Marathon! We suspended our Hello Fresh delivery while we were on vacation. Our delivery will be here on Wednesday which means Monday and Tuesday are on our own. I’ll shop food for each day. This will be one of the easiest and quickest fitness and meal plans I have ever made. We are at the beach and the plan is no plan!! My daily goal is at least a mile all week to keep my streak going. I’m sure that I will run more than just a mile. I’d like to end up with at least 22-25 miles for the week. We’re on vacation and I’m not planning a thing. We’re taking a Hello Fresh recipe with us to cook. I’m sure there will be meals out, meals cooked in and a lot of snacks too. Happy Father’s Day to all those great dads out there! I want to especially say Happy Father’s Day to my dad and hubby! You are amazing dads! Love you both! It’s Sunday so it is time to plan out my workouts and meals for the week. It’s also my first official week home and we are beach bound on Saturday!! We’ll be living it up at the beach for the whole week and I cannot wait. I’m also excited to be running some beach runs too. Saturday – Beach bound!! I’ll head out earlier in the morning for at least a mile, maybe more. Depending on time. We are still rolling with the Hello Fresh meals this week. We are suspending our delivery the week we are gone, but we are planning on taking a few recipes with us to recreate them at the beach. Last week’s Shrimp Skewers is one of them!